The bi-partisan impeachment proceedings would conclude before C-Span had time to remove the lens caps from all their cameras. Second to winning it ourselves, the most important aspect of our national lottery mania is complaining when the actual winner turns out to be an undeserving jerk, goon or garden variety moron. We feel cheated, as if there’s been some colossal cosmic mistake. How could karma have gotten it all so wrong? That’s what we’re all feeling with this crazy escapade involving Mirlande Wilson, the Maryland nut job who claims to have the winning ticket -- and says it’s not from the stack she agreed to buy for her now-incensed McDonald’s co-workers. If she’s intent on spending the rest of her life being an object of public scorn and hatred, her plan is succeeding brilliantly. Winning tickets sold in Kansas and Illinois have so far gone unclaimed (Romney’s recently been in both states, by the way). Experts say the winners are wisely waiting for the attention to die down before making a claim that’s certain to be anonymous. I think that’s wrong. A desire for anonymity should be a disqualifying factor. You shouldn’t be able to use your fresh millions to insulate yourself against all of us losers who just forked it over to you. In fact, this being a democracy and that states reap financial benefits from hosting the lotteries, I think lottery rules should be refined so everyone who plays has a say in how the winner spends his or her money. Say if one $100 million winner is a common hillbilly. We should all get to vote if he gets to blow it all on hookers and fireworks of if he has enough of an intellectual spark that educational improvement is warranted. Either way, we should all get to watch. In fact, I’d go even further. 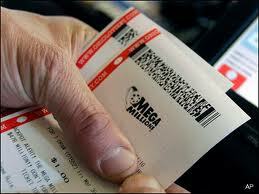 I think each lottery jackpot of more than $100 million should include a dozen winning tickets. Anyone with a winner would have to step forward and agree to take part in a “Survivor” -like reality show where the jury is the American people. People who wish to remain anonymous can drop out and be given a parting gift, like maybe a toaster. The remainders have to persuade America why they deserve the entire jackpot. Then over the course of three months, once a week, we’d get to know these individuals and decide if they’re deserving of the money. We’d find out who was miserly and who was generous. We’d learn who was caring for a sick loved one and who abandoned his family for the cheap cocktail waitress. Phoned-in or texted votes could cost $1 with proceeds going to pay down the national debt. The result would be we’d get a winner who was generous, deserving and jolly enough to be bestowed with instant riches. He’d be the kind of guy who cares about the environment, is sportsmanlike in victory and defeat and understands the importance of overtipping friendly breakfast waitresses. He’d be handsome, but not in a pretty boy way. He’d really need the money, but would be stable enough that he could be counted on to be neither miserly nor wasteful with a gaudy windfall. He’d be articulate, witty and offer three to four times a week solutions to vexing global problems on his humble little blog. Still looking for someone deserving -- besides yourself -- to root for the next big jackpot? One more hint: I don’t mean Mitt.